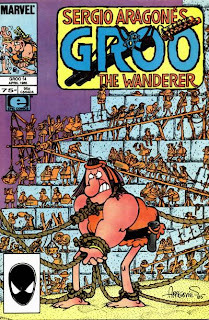 I'm not sure if there's enough story here to fill another issue, but by establishing the framework for future looks at Groo's childhood, the time spent is worthwhile. There's nothing like childhood trauma to illuminate the state of one's mental health as an adult. Next: "The Siege (Second Try)!" 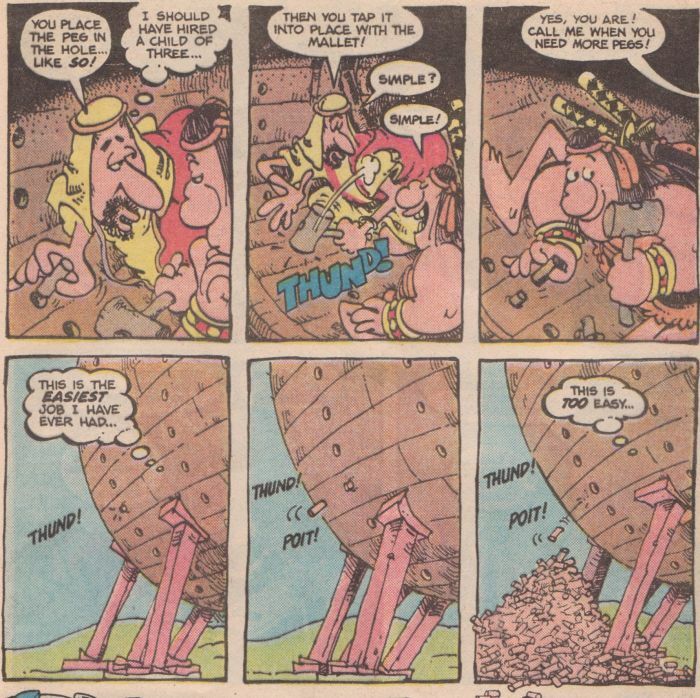 Moral: "It matters not how grand your plans when they are built on a faulty foundation." Spanish words: Cominos again, if that counts. 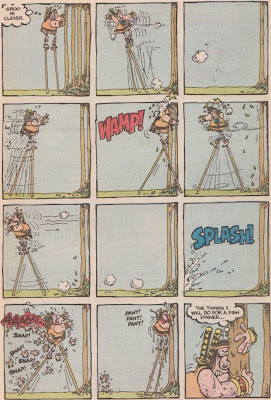 Letter column jokes: This issue's column is dedicated to retiring the running joke of defining mulch, although first Mark describes what a running joke (or "running gag", as he calls it here) is, saying that it takes something unfunny and makes it funny through repetition and that it is a lot easier than thinking up new jokes. He says the constant repetition gives the appearance of humor, a trick he learned from watching "Late Night with David Letterman", which I think is a compliment rather than a dis. 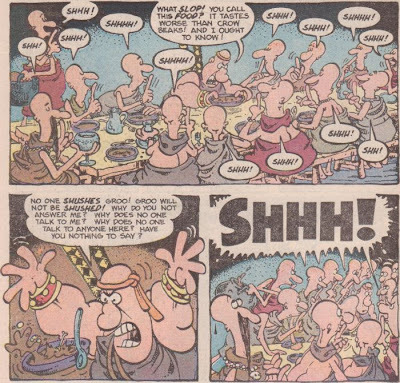 As examples of running jokes within the pages of Groo, he mentions "Did I err? ", "...as any fool can plainly see!" 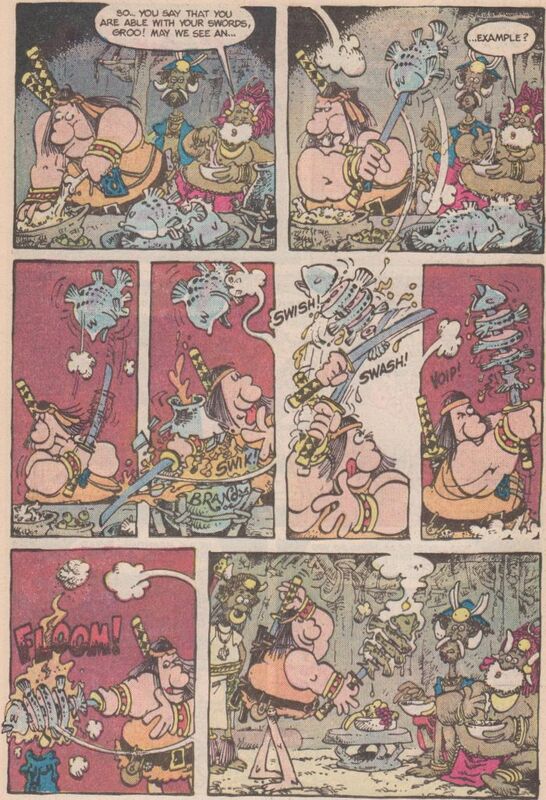 "And now, Groo does what Groo does best! 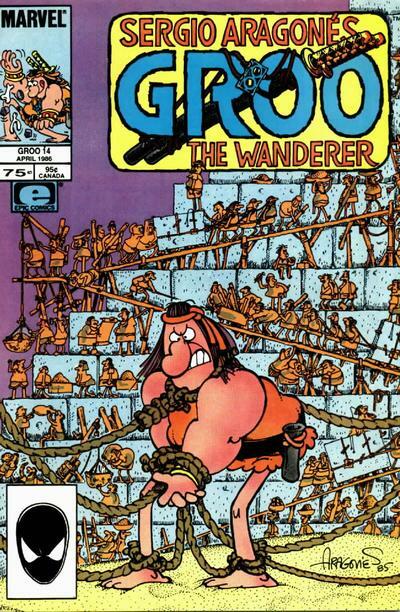 ", and cheese dip, along with the phrase "Must be Groo! ", which was one that I hadn't thought of. As a reason for retiring the mulch joke, Mark says they've run out of variations on it, but after defining mulch one last time, he suggests that the next running joke will be decided on the Sage's dog's name, which was eventually revealed to be--wait for it--Mulch. That deep, profound sadness is so alien to me as a resident of the world's wealthiest country that it hit me like a punch in the stomach. It seems impossible to me that someone who lived for sixty years and had a family could wish to exchange it all for an early suicide. The tragedy she lived through is downright incomprehensible to my sheltered sensibilities, and the fact that she is only one among so, so many should bring tears to the eyes of all but the most cold and emotionless of automatons. 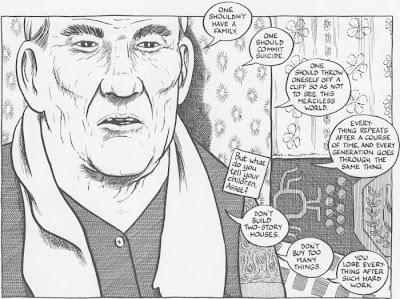 Such is the power of Joe Sacco's comics, which peer into the hidden corners of the world and illuminate the suffering of so many that are otherwise invisible to those of us in the rich, walled-off first world. 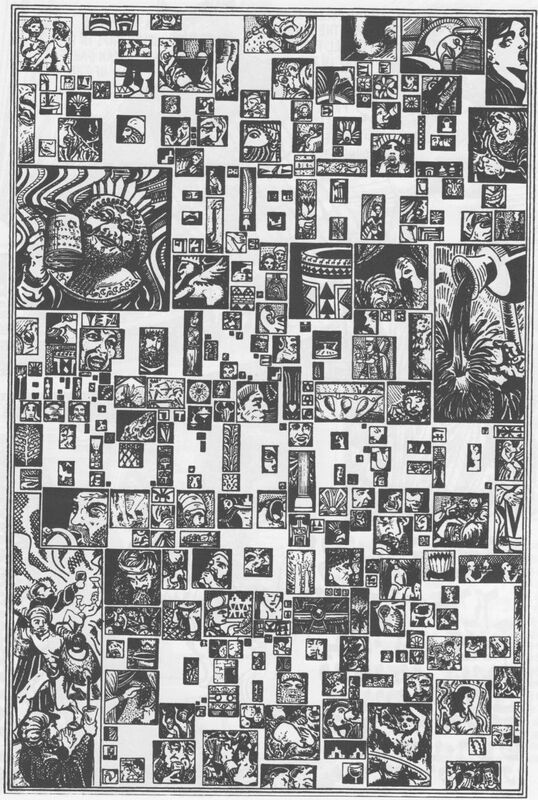 While Sacco's longer works, like the recent Footnotes in Gaza, focus on one area at a time, this collection skips through several different troubled areas, including the aforementioned Chechnya, Palestine, and the Kushinagar region of India (which is home to some of the world's poorest people); examining the war in Iraq from the perspective of United States troops, Iraqi troops in training, and victims of (probably illegal) detention by the U.S.; glimpsing the International Criminal Tribunal at The Hague as it attempts to make sense of the atrocities committed in the former Yugoslavia; and looking at the issues faced by the small Mediterranean island nation of Malta (and by extension, the rest of Europe) as it is swamped with refugees fleeing from war-torn Africa. 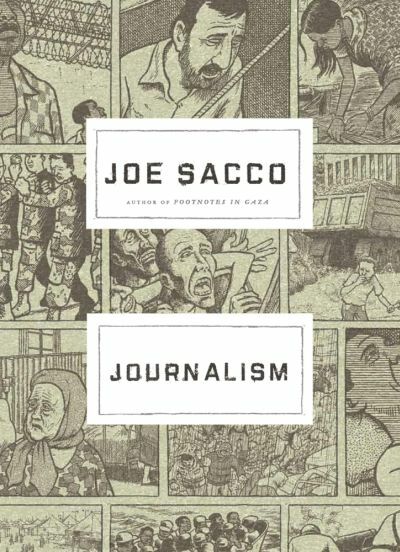 It's a wide-ranging gathering of short glimpses at some of the worst things going on around the world, and while the length of the stories are only enough to provide a taste of the issues at play, Sacco provides enough background information in each case that one feels at least a small amount of understanding, as well as some empathy for the victims, who Sacco never fails to place front and center, their emotions communicated heartbreakingly and their stories related in detail, all the facts laid out for everyone to see and become outraged by. 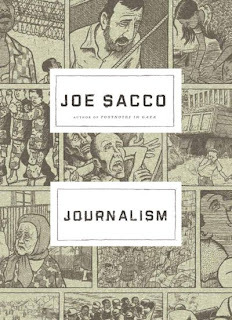 It might be a troubling service that Sacco provides, but it's a necessary one, a jolt to the system that reminds us that the world is larger than our small lives, and that our troubles seem miniscule next to those of so many who are just struggling to survive. As we've seen in the series (and specifically in this issue, when the messenger Grooella sends is repeatedly beaten whenever he asks somebody if they've seen Groo), Groo is hated and feared by pretty much everyone he comes across, yet this doesn't seem to bother him. 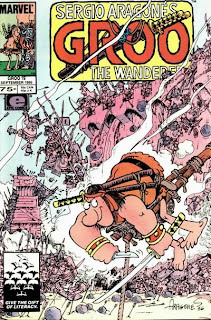 He causes death, destruction and suffering everywhere he goes (this issue's title page being a particularly effective example, depicting a city he visited that seems to have been hit by a natural disaster, with buildings leveled, people and animals injured, bodies piled up, and people rushing to put out fires), but he seems to view it all as an honest mistake, just something unfortunate that happened while he was trying to help out. 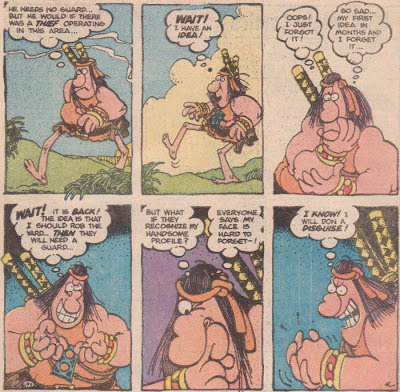 It's a fascinating level of obliviousness, and a necessary one if the comic wants to remain humorous, rather than a tragic story about a mentally deficient man who is justifiably loathed and despised by the entire world, never able to dig himself out of the hole of shame and disgust that his actions place him in. 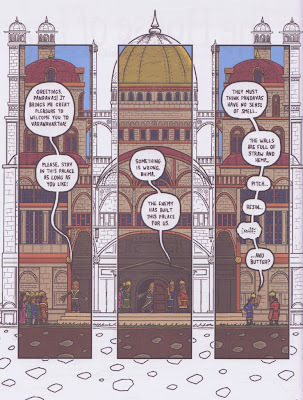 I love looking at all the little details of the book, whether in the midst of battle scenes, the background of landscapes, or the exchanges of dialogue and moments of character interaction. That richness is what always keeps me coming back for more. 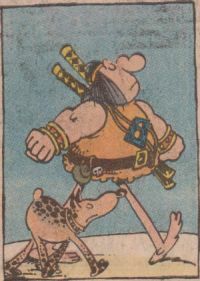 Recurring characters: Grooella, and Sage also appears in one of the flashbacks. 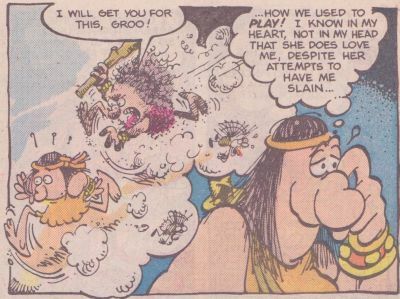 I assume this is the first flashback to Groo's childhood, but later on, strips featuring "Lil' Groo" will show up from time to time, most of them featuring Grooella and either the Sage or Granny Groo, who apparently hasn't been introduced yet either. Moral: "Blood is thicker than water...so beware of thick relatives." 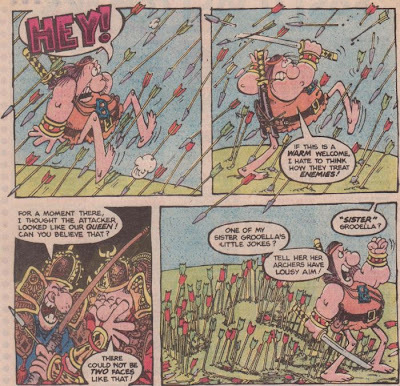 Spanish words: The army attacking Grooella's castle are called the Cominos, which might be a misspelling of camino, the Spanish word for road. 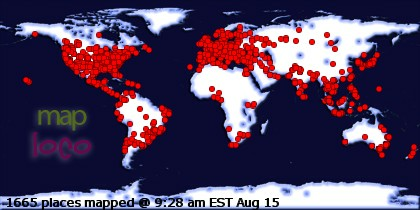 Of course, it's also an island next to Malta, a valley in Italy, and another spelling of the spice cumin. 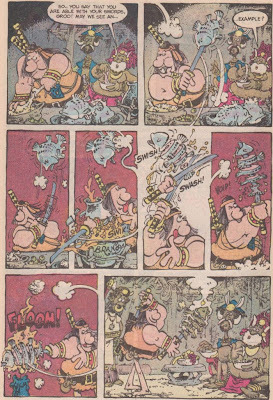 Running jokes: Groo can plainly see that the Cominos are a fierce band, and he was saying "Did I err?" even when he was a little kid. Letter column jokes: Mark confirms that the Groo Crew (Sergio, Mark, Stan Sakai, and Tom Luth) appeared in the background of the Minstrel story in issue #15 and also as attendees of Arcadio's wedding in #11. 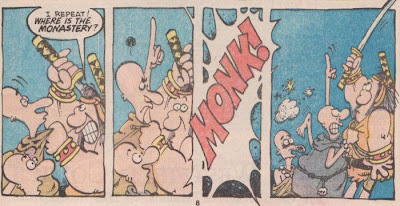 A reader named Anthony Haagsma confesses that he got his letter printed in #15 by saying he thought Groo was stupid, and apologizes for the terrible thing he has done. Mark responds by "complaining" that they only print complimentary letters because that's pretty much all they get, and sort of calls for more critical letters, which makes me curious to see if more of them (real or fake) show up in future issues. Mark also announces that the next issue will be the last time he defines mulch in the letter column (it didn't stick though), and makes a big deal about it, saying to reserve extra copies and that he doesn't know why anyone else should bother printing other comics that month, which was a good joke about hype for dumb events in comics even back in 1986. 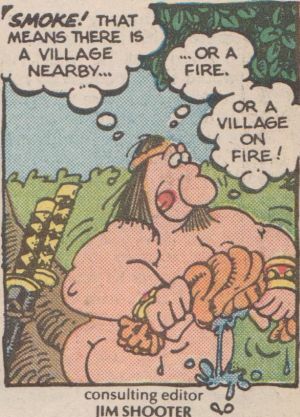 They foolishly make him the commander of their army, in order to destroy their hated neighbors, and, by attacking the first people he comes across, he quickly manages to alienate them from their allies and also make enemies of the third party meant to lead some peace talks. 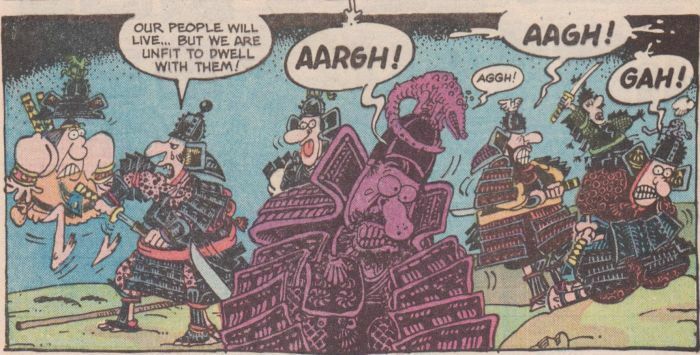 And then he manages to destroy their means of defense (a piranha-filled lake), thoroughly dismantling their means of survival amongst the people of their apparently animosity-filled land. 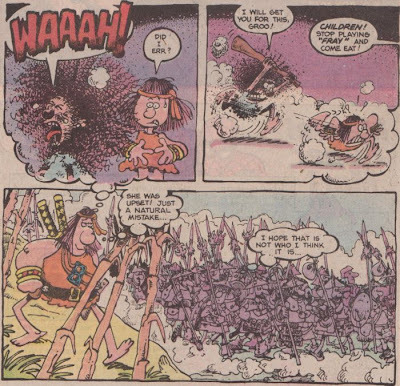 It's pretty harsh, even if it was all initiated by an attempt to use Groo to wipe out an enemy. 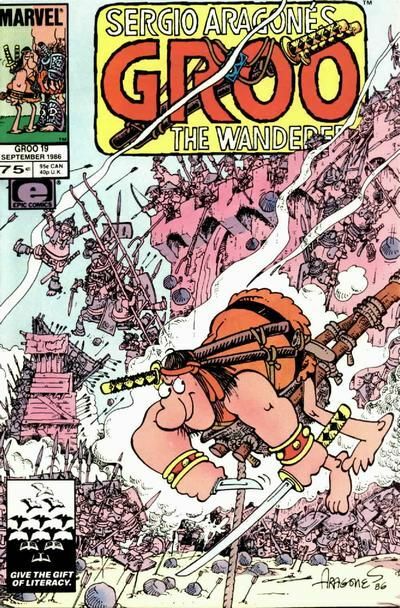 This might be another example of a plot that could have been made better by the addition of a (spotted, canine) audience surrogate, someone to comment on the action, remind us of why the people deserve what they get, and cheer Groo on whenever he screws up. We'll get there eventually. I'm not sure if that's a highlight or not. Moral: "The fish most likely to be caught is the one with the biggest mouth." Spanish words: The main village is Pescatel, which the title informs us means "hatchery". 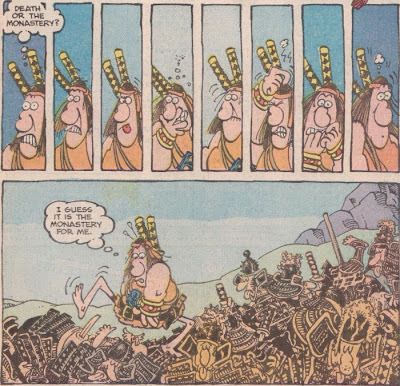 One of the tribes Groo encounters is called the Trabahos, which is a misspelling of "trabajo", or work. 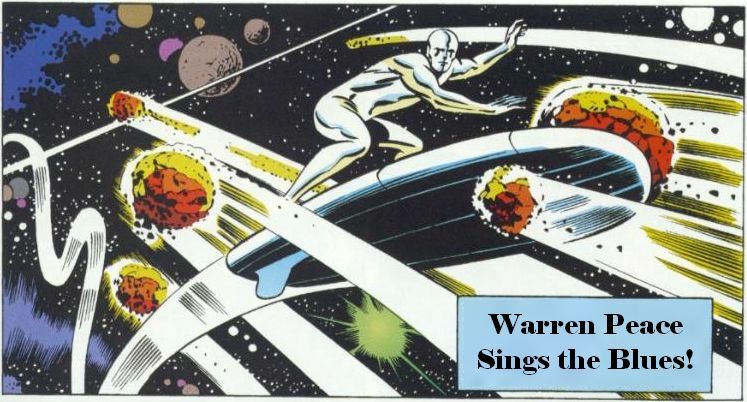 And there's also Mark's job (see below). Running jokes: "Did I err? 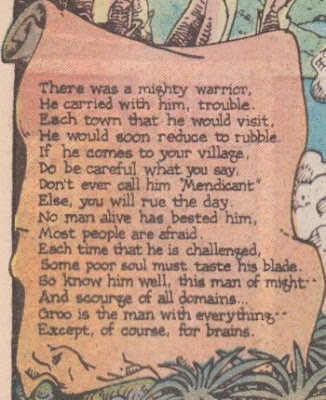 ", mulch, the title page poem advises never to call Groo a mendicant. Letter column jokes: Mark answers a couple numbered lists of questions, with the best joke probably being about why Sergio draws so many people with hats hooked under their noses: "If you saw Sergio's hat, you'd understand. Come to think of it, if you saw Sergio's nose, you'd understand." 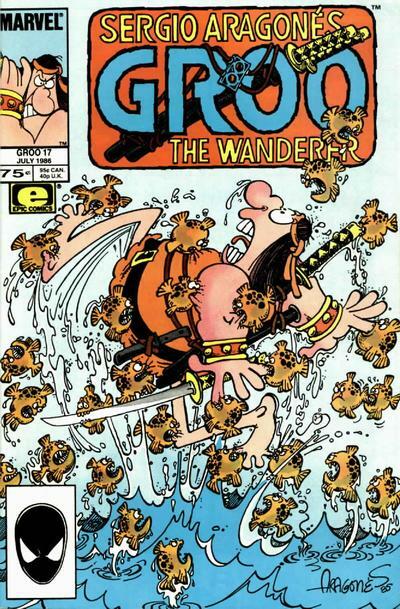 He also states that the pouch on Groo's belt contains "whatever we need to get him out of a plot problem", makes a joke about getting paid little to nothing, references the government paying farmers not to farm (I think that was a thing people joked about a lot back in the 80s), and states that Groo won't cross over with Ambush Bug because "we'd rather cross over with a humor comic." A reader pulls a Jeopardy and asks "What is a process of inbred fertilization...", prompting Mark to answer that it is called "mulching". And it's not a joke, but he gives a pretty detailed explanation of why some issues of the comic have a barcode on the front and some have a picture of Spider-Man. 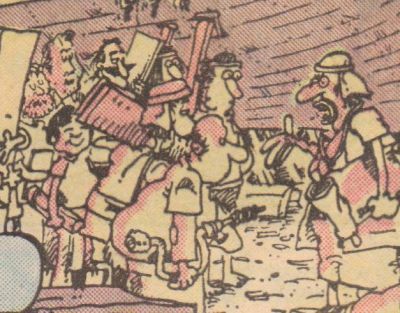 This is the second post in a series looking at notable stories to be found within The Graphic Canon, volume 1. 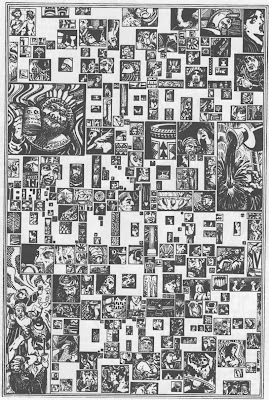 The portion of the book included here only contains the very beginning of the story, but the presentation is so incredible that I'll definitely be seeking out the entire book when I get the chance. It's a great metaphor for the entire work, in which many tiny, nearly indistinguishable characters move throughout a larger whole, standing against the massive backdrop of the entire epic. It's a wonderful little glimpse of the hugely expansive whole, enough to whet the appetite for more. Later, he runs across his "friend" Taranto, fights the army that is chasing Taranto's gang of thugs, and gets fooled into joining them when they steal a ship. Guess which one they take? This all works well enough, but there's something missing. 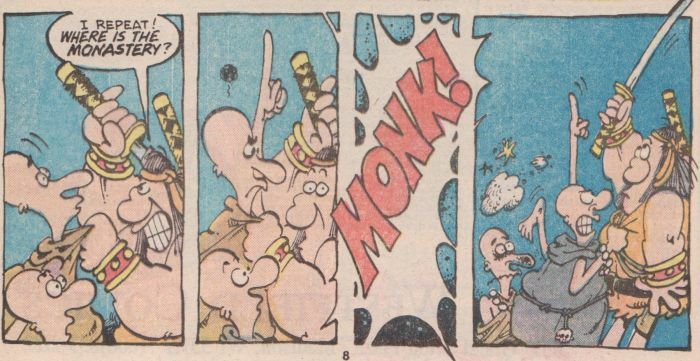 It might just be the randomness of the plot, in which a character has to show up out of nowhere halfway through to kick things into gear after they had stalled, but I think a lot of this aimlessness will be solved later on, when Groo gains a sidekick to play off of. Rufferto is one of those intangible elements that completes the recipe and brings out its full potential. Sure, I'll read it. But it'll be nice to have a spotted dog in the mix. Is this the first appearance of Stan Sakai and Tom Luth in the comic? Moral: "Trust only in incompetence. You will never be disappointed." Running jokes: "Did I err? ", "I can plainly see that!" Letter column jokes: A twelve-year-old reader says that Groo is the only comic he reads because he feels that he "outgrew super-heroes a long time ago", and he asks what a reader is to do when superheroes are all that's published. Mark replies that if he waits two years, he can start writing them. One reader (Todd Neiman) says that if Mark defines mulch one more time, he's going to scream. Mark then defines mulch in reply to another letter, then prints another letter from Todd Neiman that just says "EAAGG-GHHHHHHHH!" 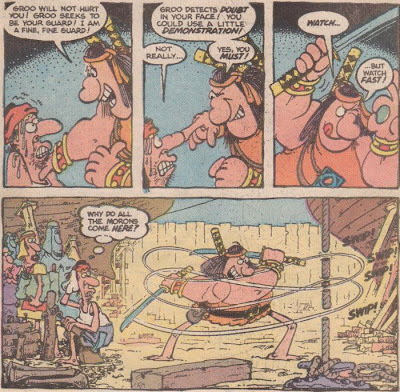 In interesting non-joke content, Mark mentions the upcoming graphic novel The Death of Groo (with assurances that Groo survives it) and plugs the Groo lead miniature figures from Dark Horse Miniature Company (which is unaffiliated with Dark Horse Comics). 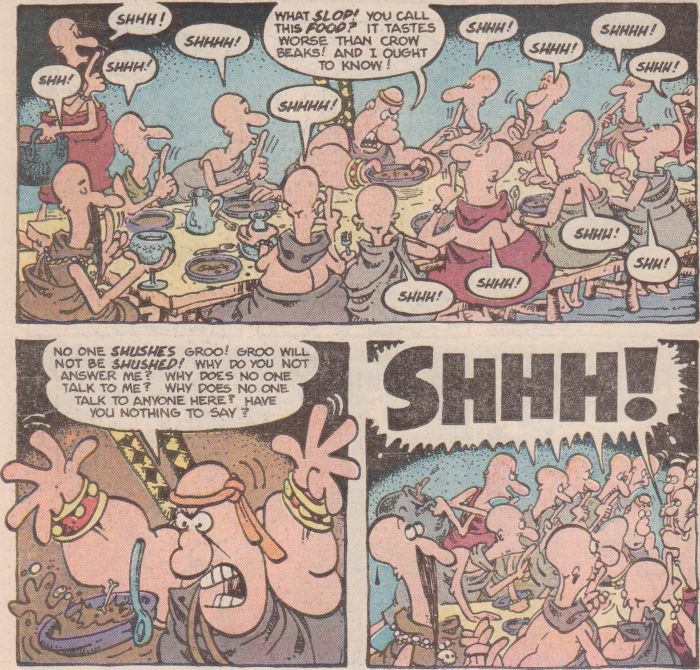 He ends up annoying everyone so much with his constant chatter that they keep breaking their own vows to yell at him, so they send him off to do some begging, only to have him completely ruin their entire way of life by convincing the local townspeople to send them wine, women, good food, and all the pleasures that they have purposely abstained from for so long. 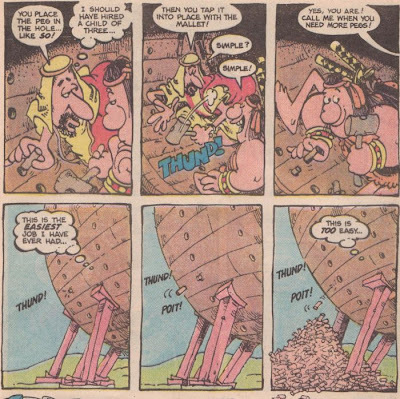 It's a pretty great demonstration of Groo's total cluelessness, his inability to understand something that is outside his realm of experience, but also his guileless nature and willingness to help out, even if it's in exactly the wrong manner. 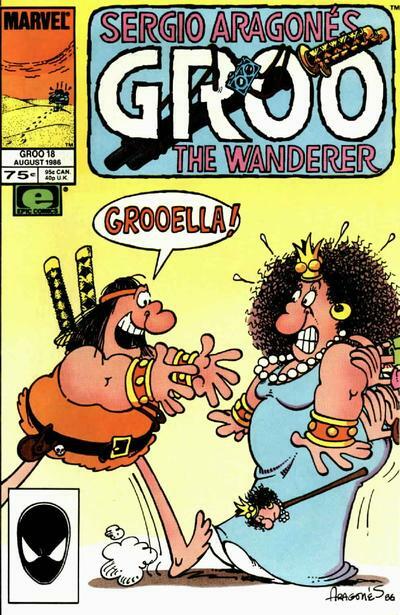 Groo usually screws things up, but he has nearly endless ways of doing so, and this is an excellent example of how his combination of good intentions and stupidity can lead to disaster. 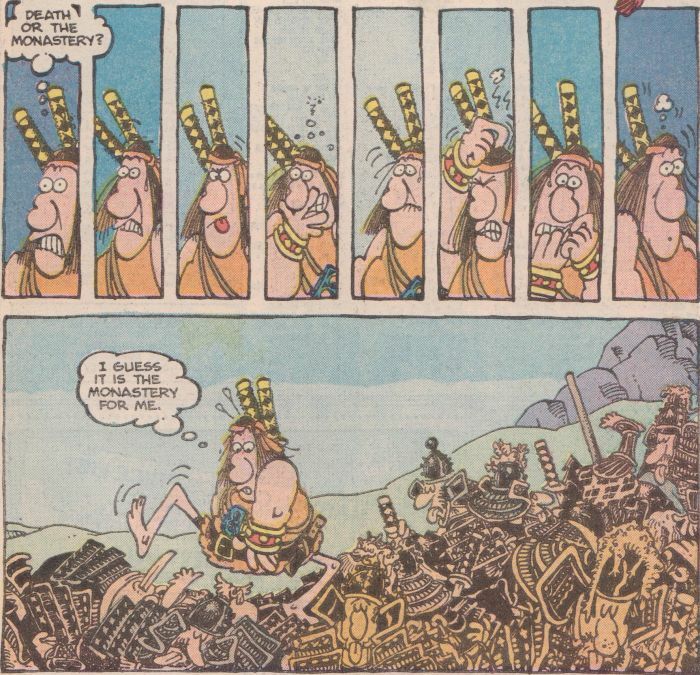 As funny and entertaining as the series is, the consistently lovely visuals are what turn it into a fully-realized world that's worth revisiting again and again. I don't think I'll ever get tired of reading these comics. 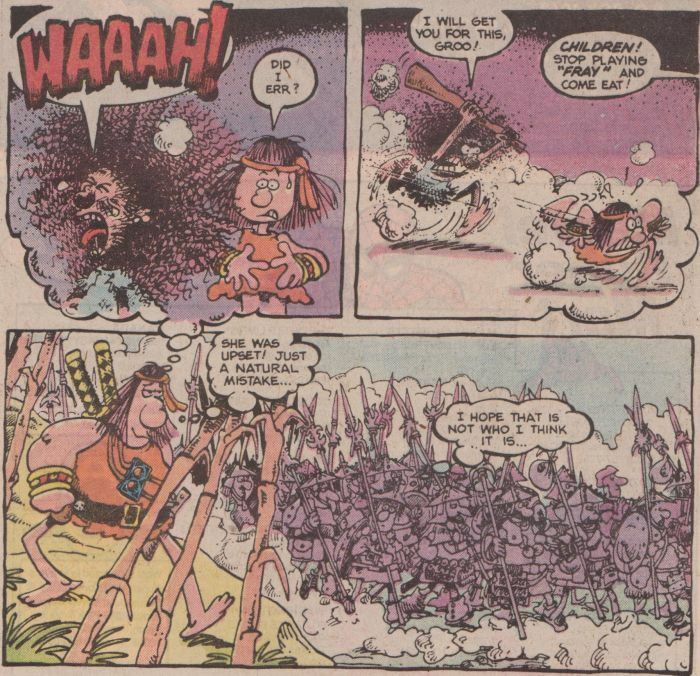 Recurring characters: The Minstrel, who gets his own backup story in which he wanders through the land singing about how music can overcome hate and spread love, but everyone who hears it ends up getting in fights with each other. Irony! 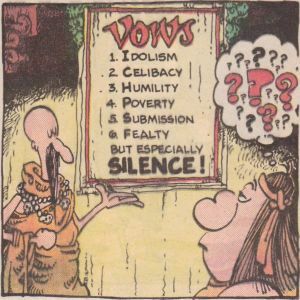 Moral: "In the contest between simplicity and silence, silence hasn't got a prayer." Running jokes: Groo gets called a mendicant, but this time it's accurate, since he is begging for money. Letter column jokes: There are some good ones in this issue. One writer asks why the fret of the Minstrel's lute keeps changing, then details every transformation it made in the character's appearances to date. Mark responds by offering a few explanations, including that Sergio has a short memory and keeps forgetting what he drew. 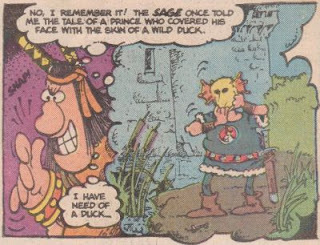 He also confirms that one of the lute-toppers in issue #11 was MAD publisher William B. Gaines, which I was curious about. Another writer complains (possibly facetiously?) that Groo is stupid, unlike "serious and mature" comics with "intelligent stories and characters (such as the X-Men)." Mark responds by defining mulch. 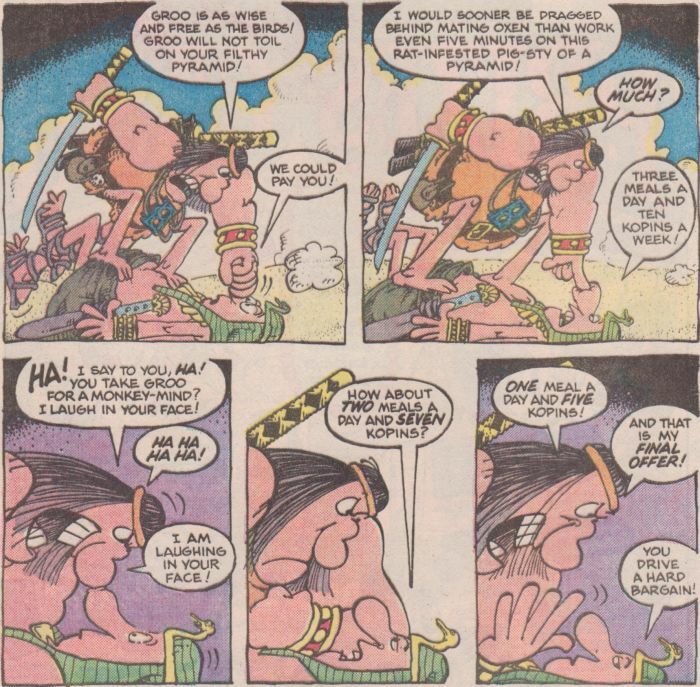 Finally, somebody asks why Groo looks "surprisingly similar to Arnold Schwarzenegger when he played Conan", and Mark suggests that if he ever meets Arnold, he should "show him an issue of Groo and say 'I think this looks like you.' But let us know first. We want to see this." 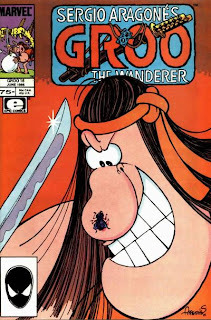 The same writer also asks what the blue thing on Groo's chest is, referencing the already-established running joke in which Mark said it was a Walkman. 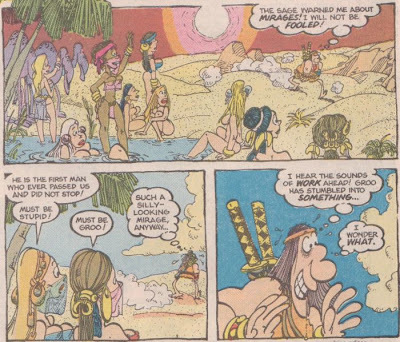 Mark replies by saying that of course it isn't a Walkman, it's a rented videocassette that Groo keeps meaning to return. 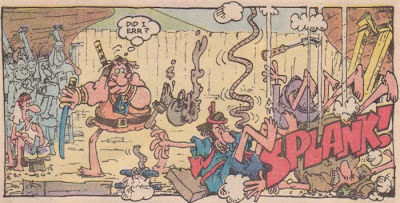 It's a pretty typical issue of the series, one that plops Groo down in a certain setting and just lets him loose to cause chaos. 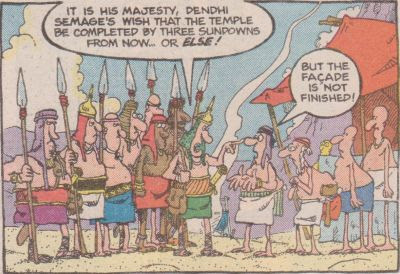 There is a bit of social justice in his actions, as a group of slaves ends up benefiting from his actions (which makes for an amusing reversal of the usual ending, as they are all chasing him to thank him, for a change), but only a slight one; the powerful keep their heel on the slaves' neck, for the most part. 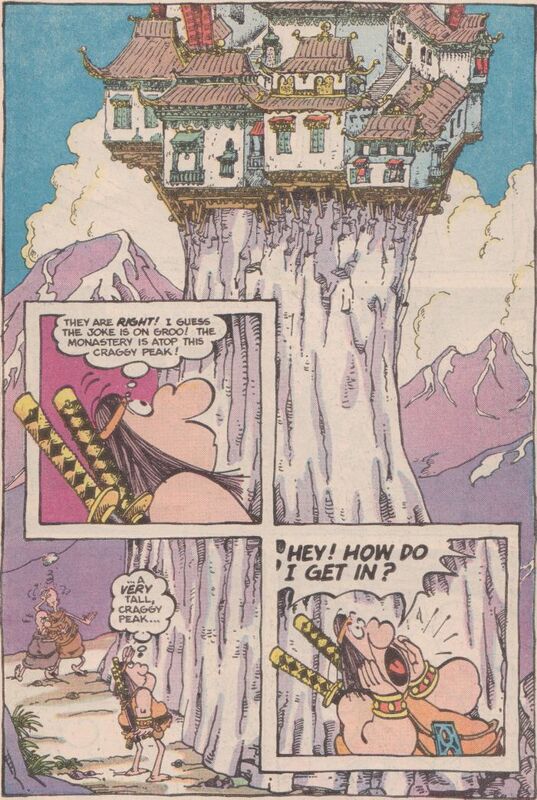 Groo is a pretty solitary figure, mostly just keeping to himself and only mindful of his own needs and desires, but it's nice to see him occasionally gain awareness of the plight of those around him, if only for a moment. Unfortunately, this isn't one of those times, but he'll be sure to get more chances in the future. 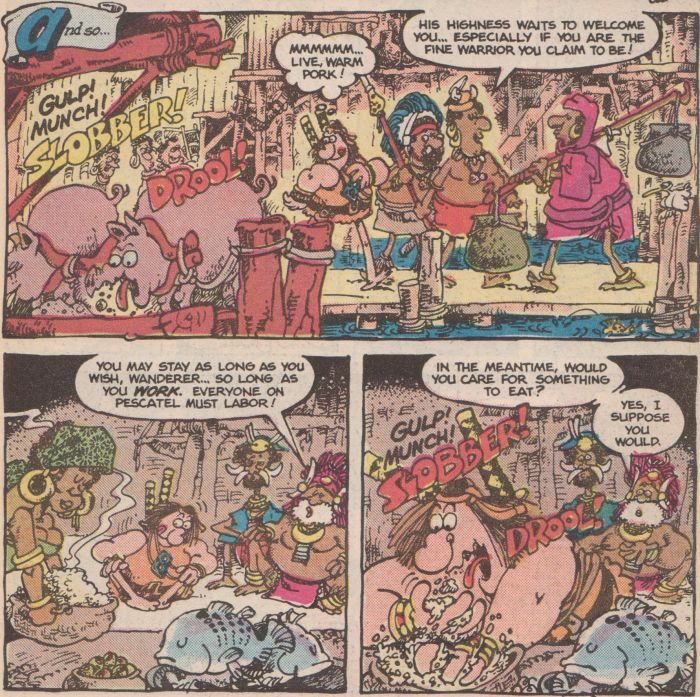 Finding these occasional bits of naughtiness hidden in the artwork of this series was a definite highlight of the comic when I was a teenager. 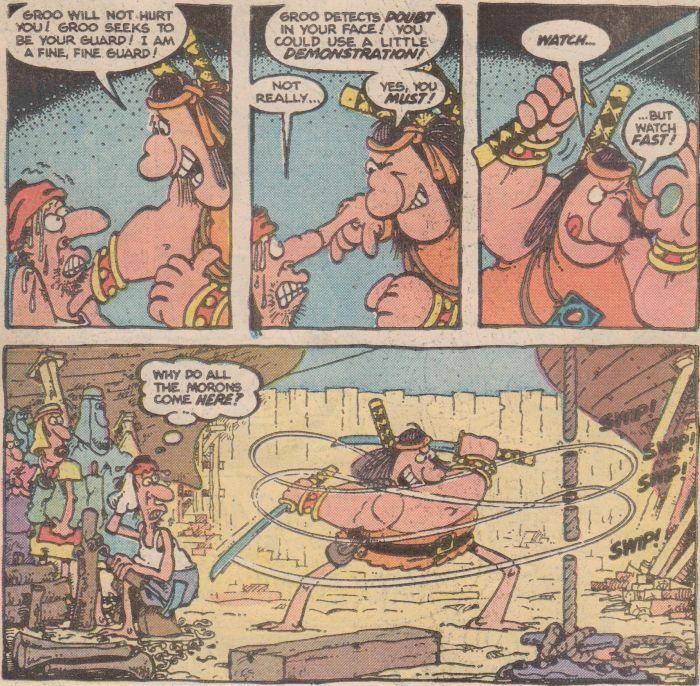 Seems kind of silly now; the fact that the semicircles Sergio drew were (are?) so alluring is a definite comment on the male libido. 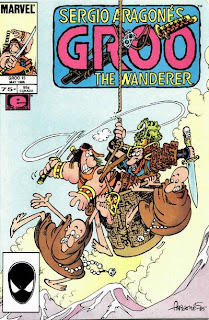 Next: "Groo and the Monks"
Moral: "When you run from your problem, you make it that much harder for Good Fortune to catch you, as well." 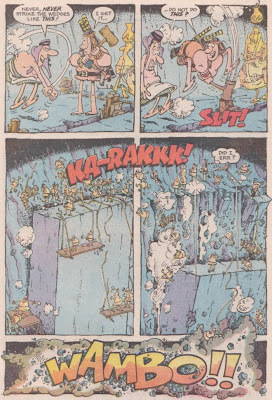 Running jokes: Groo sinks a ship and says "Did I err?". He also says that he does not know the definitions of mendicant and mulch, among other words. 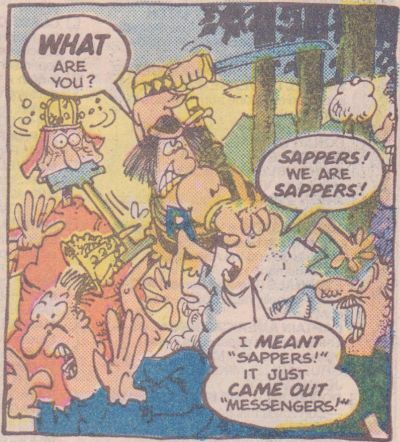 Letter column jokes: Speaking of hidden messages, Mark reminds readers (unless this is his first confirmation that they exist) that each issue since #4 contains a hidden message, describing where they are in #4 and 5, and stating that the one in #9 is just about impossible to find. 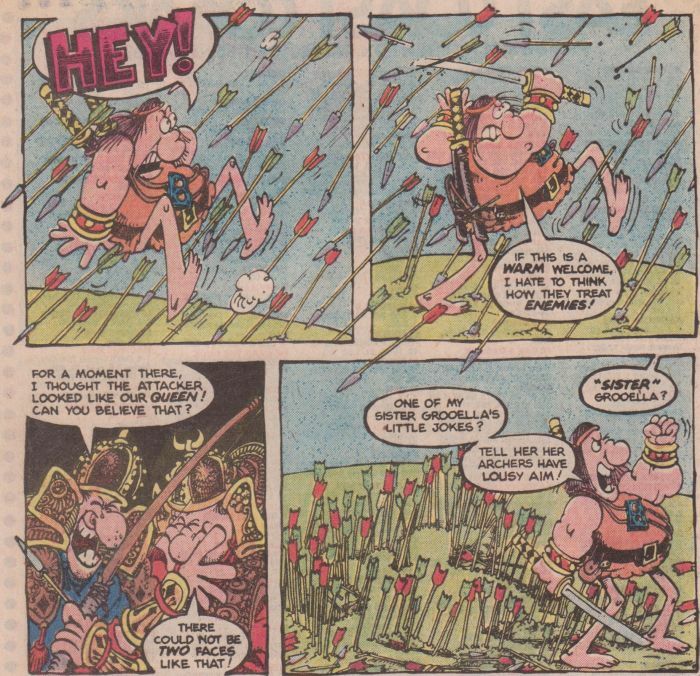 He also answers a numbered list of questions, with answers including a joke about Gordon Kent, the series' original colorist, having gone insane, a statement that there will never be a battle between Groo and Conan (yeah, right! ), and defining mulch. 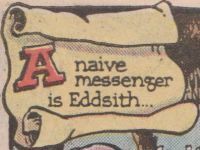 Letter writer Mark Mokszycki also references Justin Ebert (the guy who didn't like the morals) and mentions a joke about Sage's dog's name from the letter column of issue #12, which might be where that long-running gag came from, until they decided on the obvious name for him (Mulch).